FAT is 1 of the 3 major macro-nutrients, in addition to carbohydrates and proteins. Fat provides many benefits. The first being brain function… Since the brain is made up of 60% fat, EATING fat helps contribute to our cognition, thoughts, and focus. Secondly, fat helps turn off our craving centers & helps curb our appetite so we feel less hungry. Another benefit is that fat is super nutrient dense, so when you increase your fat intake (and are still physically active), consuming fat can help speed up your metabolism to burn more fat and calories. Lastly, fat helps boost our immune system and keeps our skin healthy! Low-fat diets are superior – FALSE! Low-fat can lead to nutrient deficiencies; anything labeled “low-fat” is replaced with SUGAR… The saying: “Fat doesn’t make you fat, sugar makes you fat” is TRUE; eating fat instead of carbs helps burn more calories! Saturated fats are bad for you – FALSE! Fats that are solid at room temperature clog arteries and lead to heart attack and stroke… this is also FALSE! There was a meta-analysis study that concluded how there is no relationship between heart attack, stroke, and saturated fat. 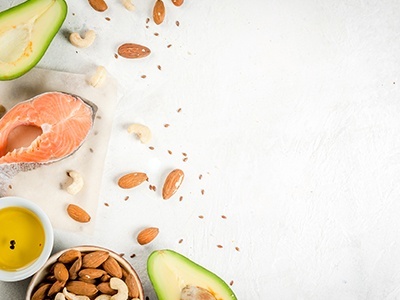 Saturated fats are rich sources of vitamin A, D, E, & K; supports function of cell membranes; they are stable; provide quality source of energy; help with hormone regulation; make you feel hungrier for longer periods of time (suppresses appetite). MCT oil (medium chain triglycerides) = extract from coconut; gives brain a boost without being an actual stimulant like caffeine; easy to digest (but don’t take too much! ); MCT is high in lauric acid, which is anti-viral & anit-bacterial! Processed vegetable oils are good for you – FALSE! Most of these are polyunsaturated fats (omega-6 fatty acids), which are fragile and damaged by oxygen and heat. They are NOT good to cook with!! Some examples of these include: sunflower / safflower / canola / soybean / corn oil (found in chips, crackers, dressings); omega-6 are inflammatory to the body… omega-3 are anti-inflammatory, so make sure to keep 1:1 ratio of omega 3:6 for a balance!